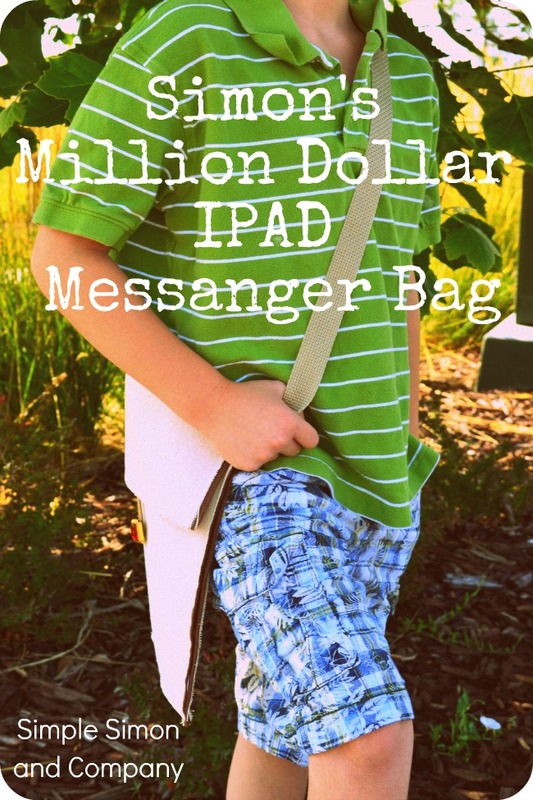 Over the summer we were invited to participate in a fun series with Melly Sews where we had to sew something for one of our boys that was inspired by a song. I had a million ideas…some that are partially completed and will yet be shared however, it was this crazy thing that I ended up sharing…. …here’s the most random project ever, in it’s entirety, just the way I sent it…. 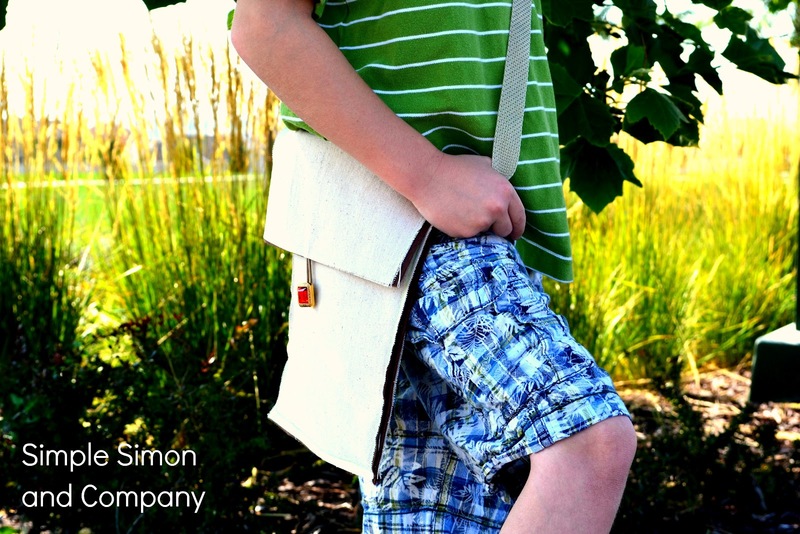 The project is a tutorial to make a messenger bag for my Simon to carry his ipad in. The ipad that he doesn’t have yet. 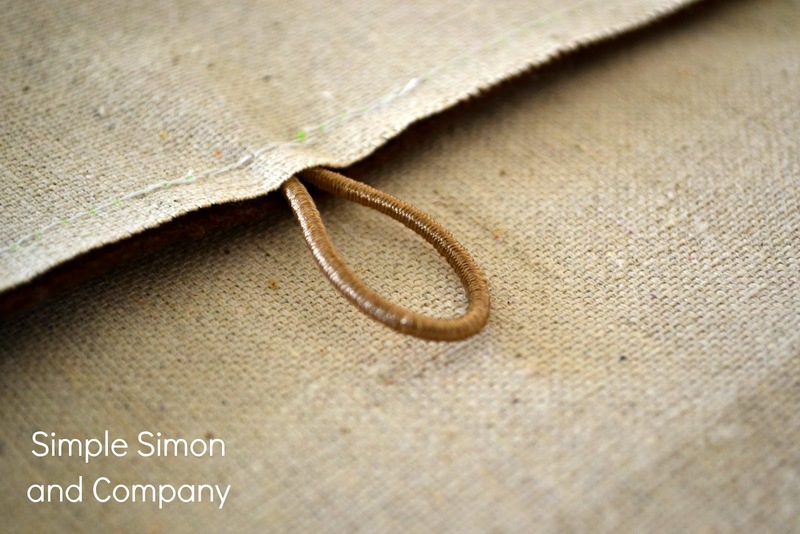 So Simon really wants an ipad…and so do I and so does my husband but we don’t have them. However, my parents and siblings (who we see all the time) all do and they let Simon play on them whenever he wants. Which makes him happy but also makes him ask when we’ll get one to which we answer “when we have a million dollars”. #1. 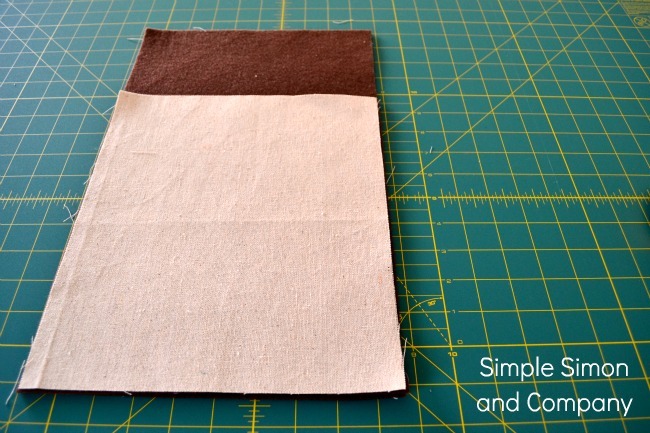 Cut 1 piece of felt and 1 piece of canvass into 9 and 1/2 inch by 15 and 1/2 inch rectangles. Then cut 1 piece of felt and 1 piece of canvass into 9 and 1/12 inch by 12 inch rectangles. #2. 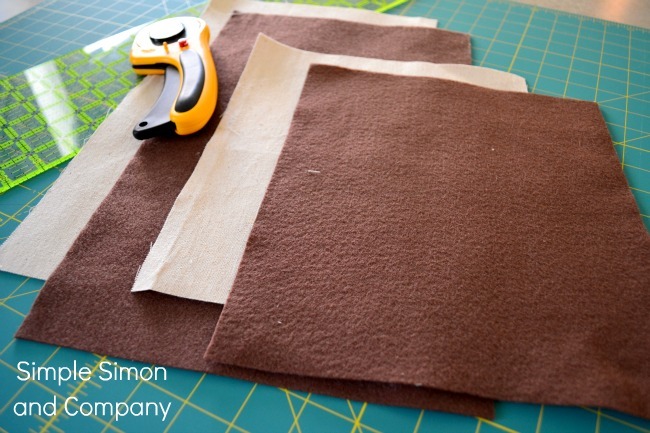 Place the 9 and 1/2″ by 12″ piece of canvass on top of the 9 and 1/2″ by 12″ piece of felt and sew a line across one end f the 9 and 1/2 inch side. 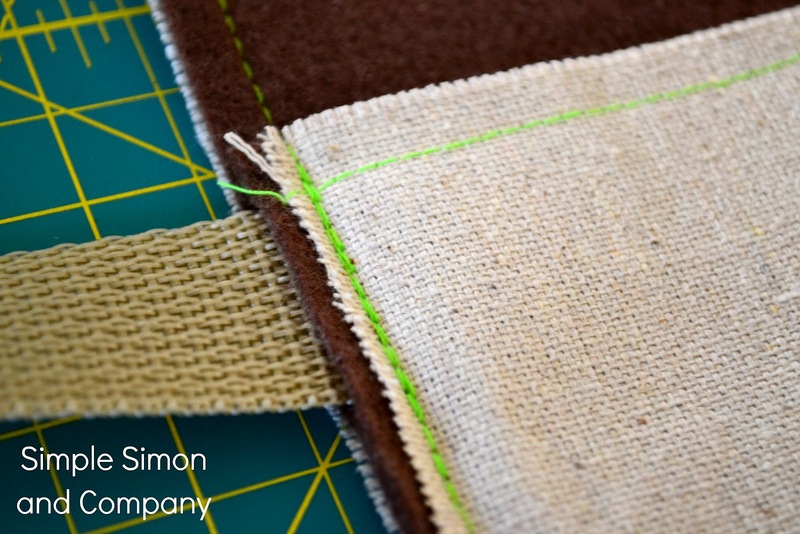 ***Note: The line that you have just sewn along one edge of the smaller rectangles should be positioned in the “middle” of the bag and not at the bottom of the bag. #4. Start at the bottom right hand corner and moving across the bottom of your bag begin sewing around the entire perimeter of the fabrics. ***Note: You will need to stop in 3 locations to insert the straps and button tab. #5. When you come to the area of your bag where the small rectangle stops and the large rectangle continues. Stop. This is where you will insert your cotton webbing for your strap. I just place an inch or so of the webbing in between the smaller and larger set of rectangles and then continue sewing. (Often I will back stitch over an area like this for added strength.) After the strap is inserted keep sewing up the side and then turn and begin sewing across the top of the bag. ***Note: For this bag I used 1 yard of cotton webbing. I just place the hair tie so half of it is in between the canvass and felt and the other half is sticking out. (Like in the picture above.) Then I sew over the top and often will back stitch over this area as well. When you are done continue across the top and down the side. 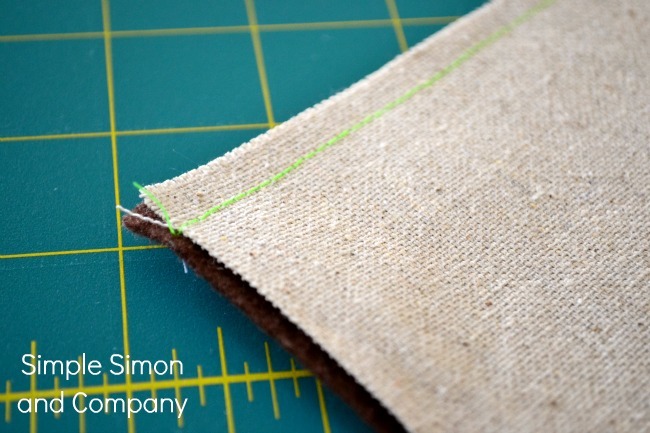 Remember to stop and add the other side of your strap and finish sewing around the perimeter until you get back to where you started from. #7. 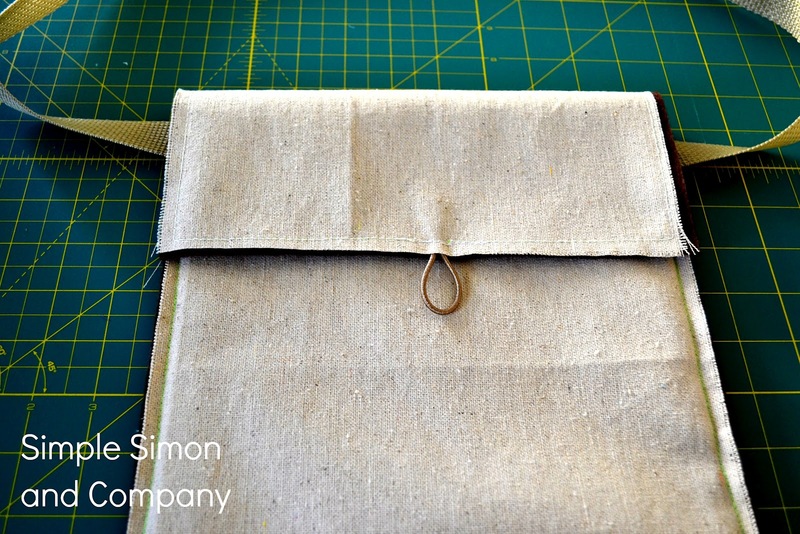 When you are done and you fold that top flap down your bag will look like the picture above. #8. 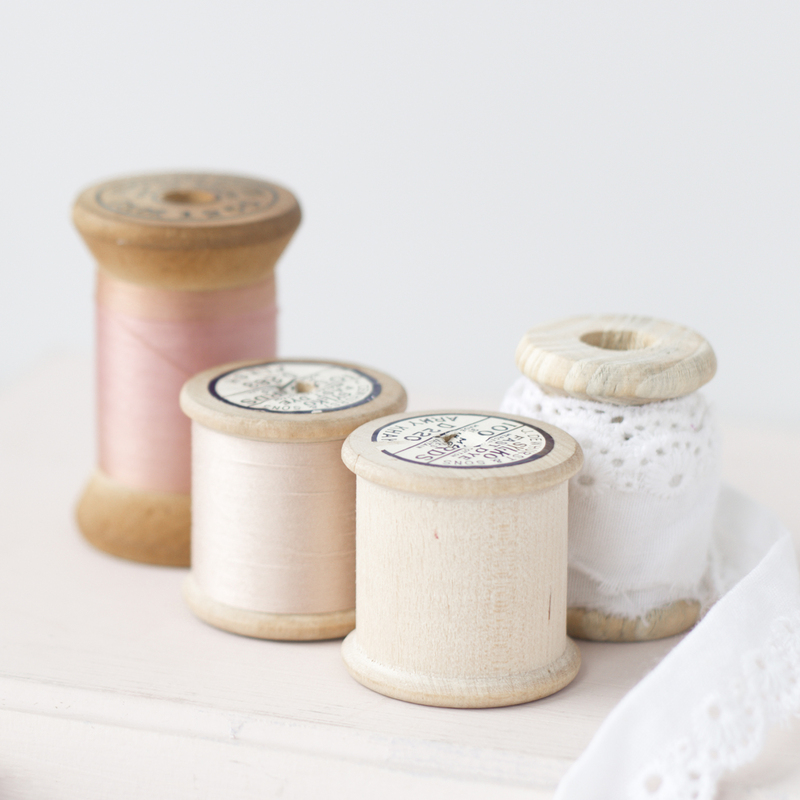 Now use your hair tie as the guide for where to place your button and hand stitch it on. Simon picked out a wicked weird button for his bag…actually he picked out the whole thing the colors of fabric and thread (anyone notice the lime green stitching?). Anyways, he picked a button from a stash I got from some nice lady’s basement. It’s a red and gold plastic jeweled one. He says it looks like an Indiana Jones treasure button, which is what he is going to use his bag for (being Indiana on his exploring adventures) until we have a million dollars or an ipad…which ever comes first. For other kooky projects and random stories feel free to visit us anytime! Ps–I just noticed 2 things…yes, I spelled messenger wrong on the title photo…I know…and I also know that Simon’s clothes don’t match…they never do. He’s 8. He’s a boy. He dresses himself…trust me, he’s worn a lot worse than this stripes and plaids combination. In other random news I’m sitting here watching Here Comes Honey Boo Boo (yes, I totally watch that show) and Honey Boo Boo is wearing the exact same shirt that I made for Grace HERE it’s just a different color. « Sew Ready to Play. Aw! I wish I had a million dollars to buy him one! 🙂 lol! Oh I and we totally wear stripes and plaid here. I even had on two different colored socks today. On purpose! I love that bag! And it’s so easy to do. May just try that one for myself one day soon.